Do you go on a family trip every year? We used to go every year when I was a kid with our family friends. My mom and other her colleagues used to prepare home made snacks for all those who used to come in our tour. Since we travel a lot, we prefer home made snacks for the duration of the tour. My mom makes many sweet & spicy snacks including spicy pori, aval mixture, masala peanuts and few laddu varieties. 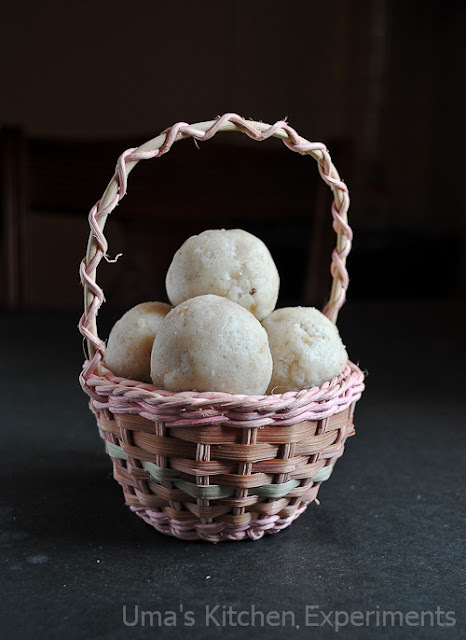 Raw rice and peanut laddu is one among those recipes which she prepares not only during trips but also as a common evening snack. 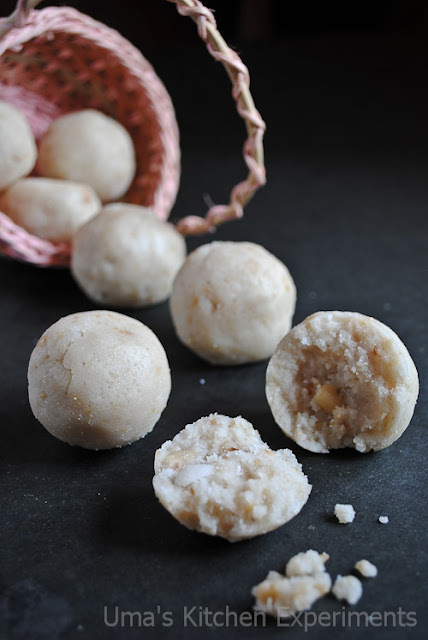 I am very fond of these type of home made laddus and whenever my mom visits me, with the help of her, I prepare them in large numbers and store it in a container. 1) Soak raw rice for 1 hour. After an hour, drain the water completely. 2) Dry grind them without adding warer. Make a powder of it. 3) Sift the ground rice flour to separate the small rice grains. You can again grind them to get soft and smooth rice flour. 4) Next, dry roast the peanuts and peal the skin of it. Put in a mixer and make coarse powder of it. you can alternatively crush it using a rolling pin. Keep it aside. 5) Make a coarse powder of sugar along with cardamom powder and dry ginger powder. 6) Take a kadai / Wide pan and dry roast the rice flour till it slightly changes in its colour and the raw smell of it goes off. Allow it to cool to room temperature. 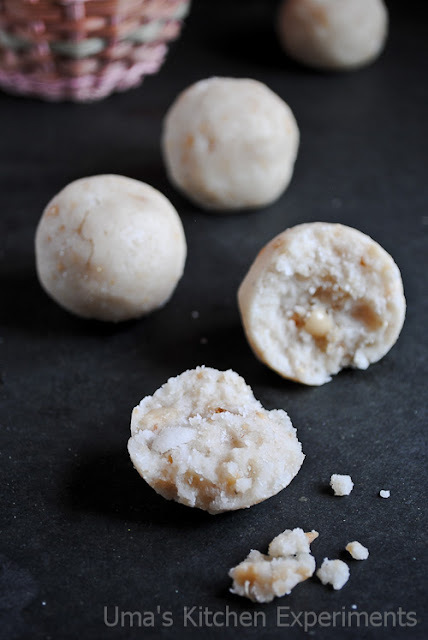 7) Mix all the ingredients (Rice flour, peanuts, sugar, cardamom and dry ginger powder) in a wide bowl. Mix well. 8) Heat milk in a sauce pan. When it is boiling, turn the flame off and add a tablespoon of milk at a time to the mixture in the bowl. check whether you are able to make balls out of it. If not, add more milk and try again. Make tight round shaped balls. 9) Store it in a container. It stays good for a week in room temperature. 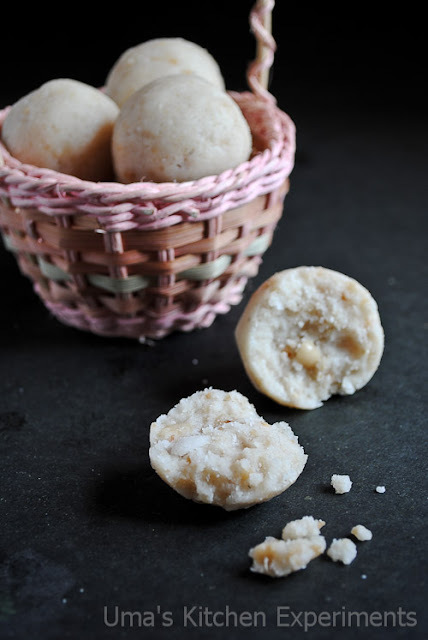 1) Instead of milk, you can also use ghee to make laddus. If you add ghee, the laddus stays good at room temperature for more than a week time. 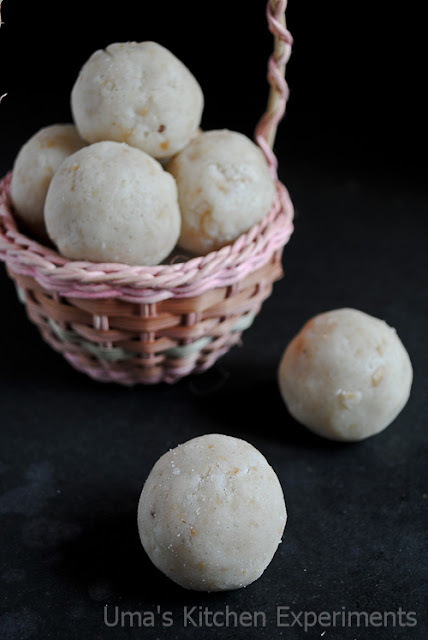 2) Add milk very slowly to make laddu balls. The milk added should be just enough to make tight round balls. Do not add more milk. otherwise, laddus won't hold the round shape. 3) Add more peanuts if you prefer. Heading for the first time...healthy n delicious laddu! Yummy and tempting ladoo,will surely try this. Love to munch on anytime, looks like snow balls!! @ Sharanya, Thanks a lot for pointing out. I corrected it now. Very attractive snow balls like laddoos, soo cute and droolworthy. Inviting laddus,love to have a bite dear..yummy!! Never tasted this ladoo...sounds yummy. ..nice clicks.